Troops in the 2nd Boer War had begun the tradition of writing letters home about what was happening around them at the front. Almost accidently, they had started another tradition - their families sent these precious letters on to local newspapers and editors jumped at the opportunity of publishing them. From the very first days, soldiers in the First World War continued the same tradition as did newspaper editors eager to publish them. At the beginning of the1914 - 1918 War, our army in France consisted of a mix of Regular soldiers, Reservists who had been recalled to duty, and men who were Volunteers. When they left England in the second half of 1914 to go to the front in France, they were full of optimism and the conviction that the War would be over by Christmas. Well, Christmas came and went and in the early weeks of 1915, an astonishing set of letters began to appear in local newspapers all over the country. The War Office read them and were horrified because it was perfectly clear that our troops on the ground had fraternised with enemy soldiers over the Christmas period and that a widespread unofficial truce had, in effect, taken place on the battlefield. Immediately, there were repercussions all the way up the chain of command to the most senior officers as the War Office reacted. What kind of leadership could allow this to happen? That an army of fighting men should behave like this was unthinkable and they reinforced their message with the introduction of the death sentence as punishment if any similar events occured again. It is quite clear from the letters, that what the men felt was humanity, not treachery. 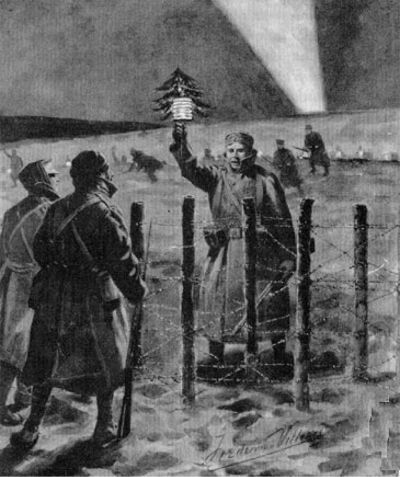 They saw themselves and the German soldiers as brothers-in-arms - all stuck in the same mud holes, all fighting for a cause which they did not wholly understand and all wishing the same thing - that they could be back in their homes enjoying Christmas with their families.